Home » Anime » Overlord Characters Roster: Behold the Army of Nazarick! Among the most popular anime series recently, Overlord definitely comes out as one of the top 10. And true to its reputation, Overlord season back in 2015 was an excellent anime and it got tons of fans ever since. 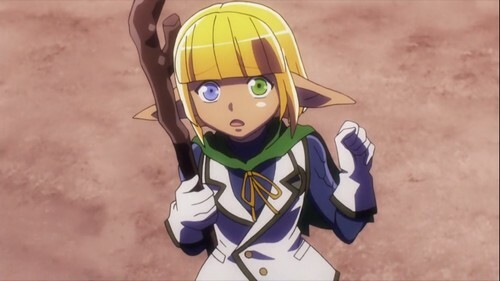 Despite using quite a cliché concept of “isekai” (or resurrection in another world), Overlord managed to create an unique and interesting story for its own. As the Overlord season 2 has already launched on Jan 9th, it is probably a good time to round up all the badass characters from the Great Tomb of Nazarick. So with no further ado! Let’s check them out! 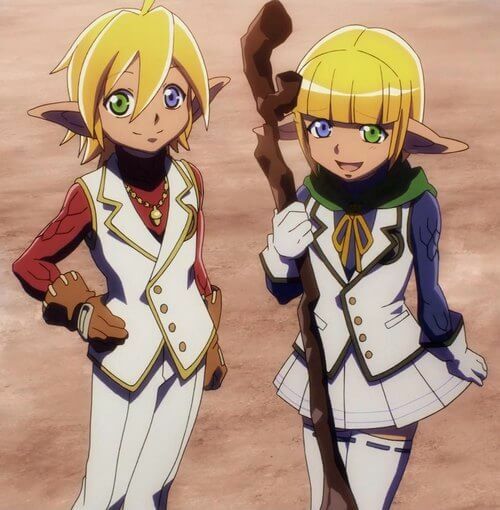 *Note: We will only include characters which have made appearance in the Overlord season 1 and season 2 anime so far. The very first Overlord character we have to talk about is the leader of the infamous guild leader of Ainz Ooal Gown himself: Momonga. Before his reincarnation in the New World, he was a human named Suzuki Satoru. At certain time in his life, his mother died due to overwork, leaving him no family or even outside friends to support him except for his gamer friends in the game YGGDRASIL. After his mysterious reincarnation to the New World, he takes the form of his in-game character Momonga – a powerful skeletal sorcerer and the leader of Ainz Ooal Gown. 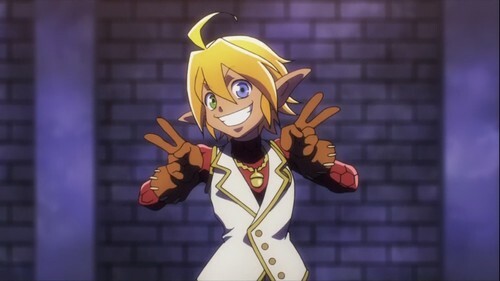 In season 1, he soon changed his name to Ainz Ooal Gown and hoped to find his comrades if they also got transferred to the New World. After being transferred to the New World, Momonga totally has a skeletal body with undead traits. He admits to himself that he has become cold and his emotions are almost fully suppressed. Since he is living in a totally different world, he gets extremely cautious about everything surrounds him. He always does things carefully with thoughtful plans. Outsiders may look at him as a scary and fearsome skeletal mage, yet actually, he is good and benevolent in nature. He showed great care for everyone under his rules, including members of Nazarick and even people who are not originated from Nazarick. That said, he is not a typical hero figure, but rather, his only dedicates himself for himself and the Great Tomb of Nazarick. 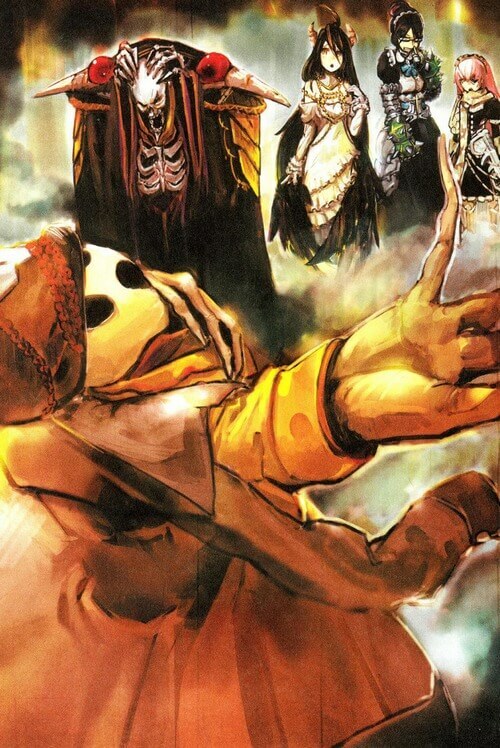 All denizens of Nazarick also pay him great respect and revere him as their god since Ainz and other guild members were their creators. Power-wise, Momonga is not the strongest member of Ainz Ooal Gown guild despite being an extremely powerful sorcerer himself. Interestingly enough, according to the game YGGDRASIL, a level-100 player can only learn 300 spells at max. But in Momonga’s case, he can learn even 718 spells. That said; the true power of Momonga does not rely on raw strength but rather, his strategic planning. 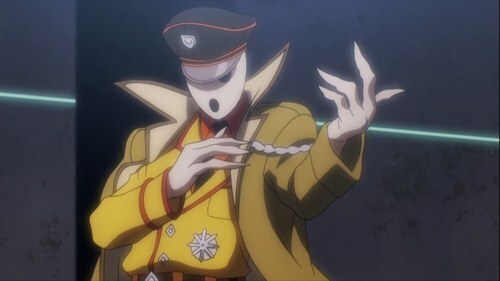 He is considered to be an extremely versatile combatant among Ainz Ooal Gown ranks. In the New World, Momonga still keeps his strategic mind and carefully plans ahead of everything. He takes an extremely careful approach towards this new realm and for most of the time, his plans work. Nonetheless, he indeed has power, mind, intellect, and appearance suiting an Overlord of Nazarick. The first NPC met by Momonga when he got transferred to the New World was Albedo – Overseer of the Guardians. 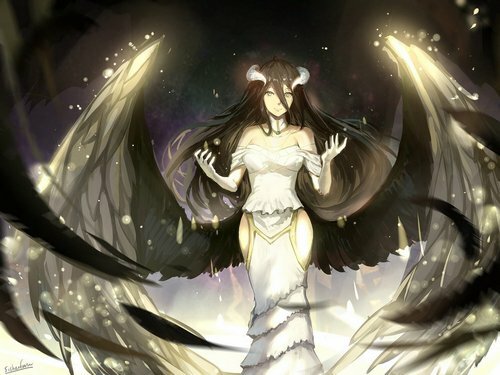 Albedo was introduced as a succubus wearing pure-white silky garb with black hair and wings. As the Overseer of the Guardians, she is in charge of managing and supervising other 7 Guardians. She also seems to have the most powerful voice (only second to Momonga – Ainz Ooal Gown of course) and she tends to openly express her opinions about matters. She has no problem in rejecting, denouncing actions or statements which considered as inappropriate. While this shows her loyalty strongly to Nazarick and especially Ainz Ooal Gown, at certain occasions Ainz had to stop her personally. Aside from that, Albedo is an extremely intelligent figure who can calmly analyze and give ideas which Ainz probably ever thinks of. 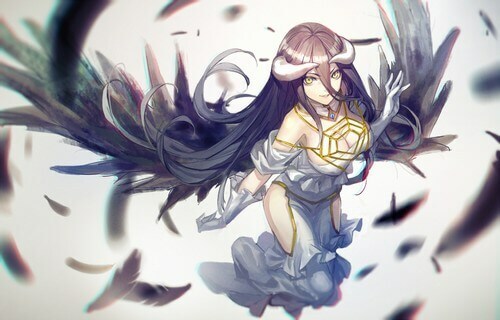 Funny thing is: Albedo extremely loves her lord Ainz. 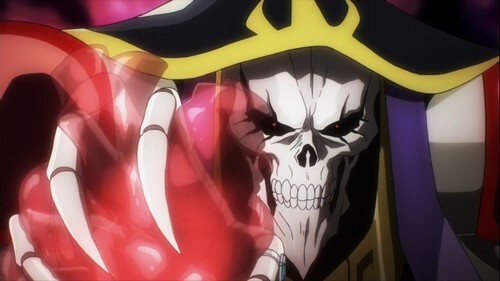 This is due to Ainz’s doing when he modified Albedo’s program to love him before he was transferred to the New World. She even shows high sense of jealousy towards every woman who seems to be close to Ainz. Although she is fine with Ainz having multiple wives (since most kings are like that? ), she wants to be the most loved one and she even claimed herself as “legal wife”. Bizarre indeed, but probably that’s what makes fans love about her character. When we talk about “succubus”, we mostly think about beautiful yet malevolent creature who allures men and then gives them a “delightful death”. But surprisingly in Albedo’s case, she mostly focuses on defensive power. To some extent, she is like the “tanker” with probably the highest physical and magical defense capability among Nazarick members. Overall, Albedo is definitely an interesting and lovable character. Many people already considered her to be the best “waifu”, but what about you? Do you agree? 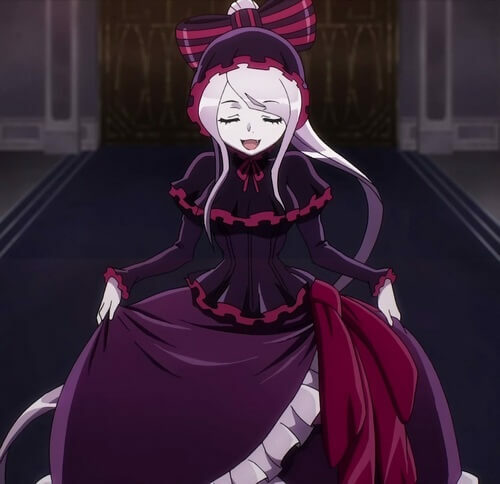 Among all the members of Nazarick, Shalltear probably has shown the most of her power and also her characteristics. She is often seen in the form of a human 14-year-old girl who wears black, gothic-style evening dress. Shalltear is often described as the “true beauty” and to be honest, she does look cute and beautiful. Funny enough, due to her “child-like appearance”, she often tries to overcome such features with breasts padding. But before some of us may have… “special affection” towards Shalltear, think again because her true monster form is indeed crazy and terrifying. In terms of personality, Shalltear is kind of flirty and she has no problem in expressing sexual preferences. While being somewhat shameless in this regard, she is actually innocent about certain things. And talking about “flirty”, Shalltear also shows love affection towards lord Ainz. She can be considered as Albedo’s rival in terms of this bizarre love affair with their god. Besides her affection, Shalltear is also extremely loyal to lord Ainz. When things do not go her way, she tends to fall into panic state in which she is afraid of being a nuisance for lord Ainz. 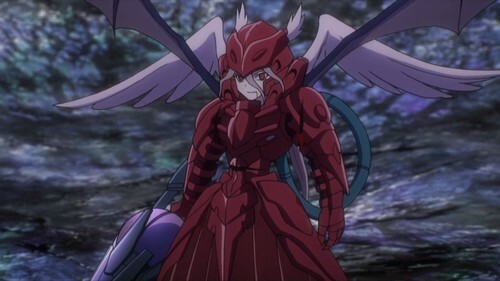 In fact, if you have seen Overlord manga or the anime, you probably have seen that Shalltear falls into depression after her battle with Momonga back in the season 1. She thinks that it was her fault to disturb her lord and she deserves to be punished. 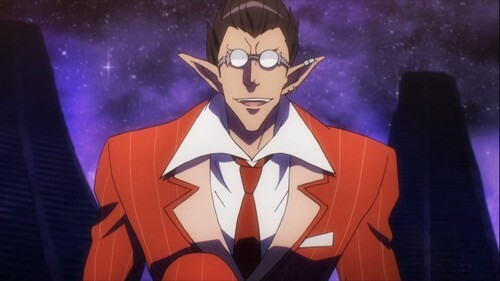 Guarding the 7th Floor of Nazarick is Demiurge – an Arch Devil with extremely high intelligence. He is an arch devil with quite interesting characteristics. Normally, he takes the form of a tall gentleman wearing a red suit while still showing a silver tail. As a demon, Demiurge is considerably a cruel being who prefers torturing and experimenting on other lesser beings. Yet interestingly enough, Demiurge is indeed cruel towards the outsiders; however, he is kind towards denizens of Nazarick. Not only that, he pays extreme respect towards the supreme leader of Nazarick – Ainz Ooal Gown. Being cruel aside, he surprisingly has high sense of artistry. He is an incredible craftsmanship and he also likes creating beautiful artworks although such artworks come from the victims of his experiments. 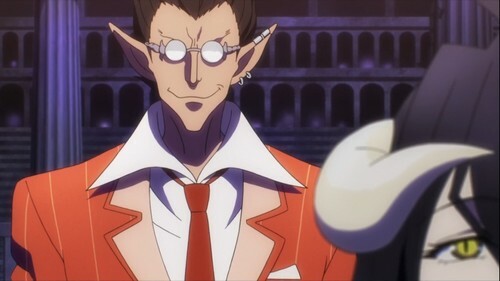 In addition, Demiurge is not simply a mere demon; he is an arch demon who takes of charge as Commander of Nazarick Defenses. His true power is not only about mere personal strength despite already being a powerful character himself. The true extent of his power lies on his intelligence. 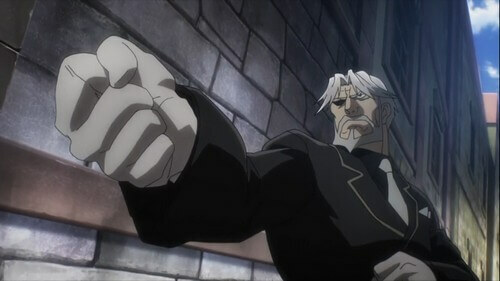 Besides Momonga, the only people who can match his intellect capability are Albedo and Pandora’s Actor. Currently his power and intellect prowess have not displayed much, but we can expect Demiurge to show more of his power in this season 2. Coming in number 5 we have the Guardian of 5th Floor – Cocytus – Ruler of the Frozen Glacier. Despite his race is called as Vermin Lord, Cocytus is totally not a vermin, at least in terms of size. 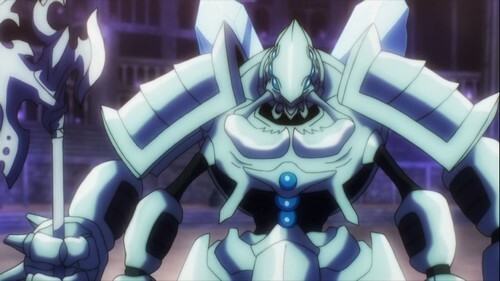 He has a humongous body with bug-like features, ice affiliation, and 4 powerful arms. As a Guardian of the 5th Floor, Cocytus takes a great pride in his work and he prefers to be the “sword” for lord Ainz which readily charges into the battlefield and cuts down enemies. In addition, Cocytus is a warrior at heart. He definitely takes great pride in being a skillful warrior and he also pays respect to other honorable warriors including those outside of Nazarick. 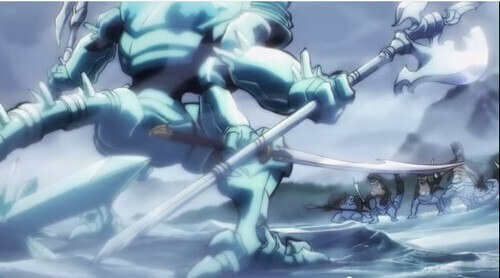 In terms of combat capability, Cocytus is also exceptionally strong with his 4 arms. Normally in combat, he can uses up to 4 weapons at once with no problem. He also possesses a huge arsenal of 21 different weapons, including the infamous God Slaying Emperor Blade which was once in the possession of his creator Warrior Takemikazuchi. Besides being a weapon master, Cocytus’s body is quite special as it can fully be weaponized. Finally, he can use various ice-type abilities like his passive skill Frost Aura which surrounds himself with chilling aura which deal continuous ice damage and slows the enemies. It is hard to say how strong Cocytus is compared to other Guardians, but he definitely comes out among the top warriors of Nazarick. The twin Aura and Mare is a special case since they are both Guardians of the 6th Floor and both are created by a single creator named Bukubukuchagama. By first glance, you may think that Aura is male while Mare is female. But on the contrary, it is vice-versa. This bizarre choice of design was due to Bukubukuchagama’s thinking that younger brothers should listen to elder sisters. It also explains why the twin has peculiar personalities which we will discuss later. For Aura’s outfit, she wears dark-black dragon skin with white vest on the outside, while Mare wears blue dragon leather with white skirt (pretty weird for a boy huh?). The sister Aura is a cheerful and tomboyish girl who can openly express her emotion and thought. She often orders her brother around and takes him to wherever she wants to. In addition, Aura and Shalltear often quarrels with each other. This may not sound as much at first but if we take their creators into consideration, Shalltear creator – Peroroncino and Aura’s creator Bukubukuchagama are actually brother and sister in real life. And as you might have guessed, they also often quarrel with each other and as the results; their creations also inherit this… trait. On the contrary, the brother Mare is completely opposite to Aura. He is shy and most the time he does not seem to express his opinion confidently. Also unlike Aura, he does not seem to have any sort of conflict with Shalltear (or at least he does not openly talk about that). But no matter how different they are, the twin shares a same characteristic: extreme loyalty towards their creators and in this case, Momonga – Ainz Ooal Gown. In terms of power, if you have looked at Aura’s jobs, you will see that she is kind of hunter – beast master. For easier imagination, we can compare her to Hunter Class in World of Warcraft. As a hunter and beast tamer, Aura does not excel at straightforward combat but rather, she relies on long-ranged, guerilla-style of combat combining with her beasts. On the other hand, Mare is a druid with supporting and nature-controlling abilities. Although we haven’t seen Mare in battle, it is said that his fighting capability can be comparable with Shalltear. Victim is an unique case among the Guardians of Nazarick due to his many unique traits. 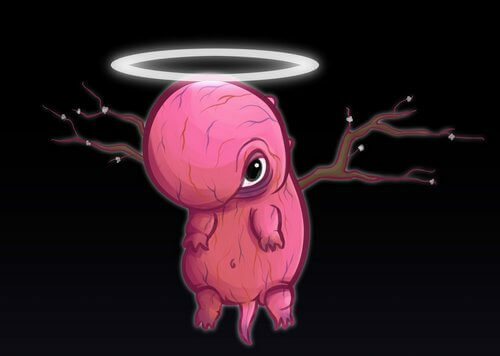 First of all, despite being angel, Victim has a… weird appearance of a pink fetus with angelic halo and stick-like, feather-less wings. Victim is rarely seen and his level is the lowest among all the NPCs in Nazarick. To this state, some people may ask: why he is put in charge of the 8th floor? The answer is that: although he has low level (35), he possesses an unique ability which sacrifices himself to restrict enemies’ movement. This may sound insignificant but in fact, this ability is extremely devastating given its usage along with his low level and appearance. According to the Light Novel, there was an invasion from 1500 players back to the days when Momonga hasn’t transferred to New World yet. They managed to invade to the 8th floor; however, they were stopped by Victim, thus leading to their demise. Since resurrecting a NPC of level 100 can cost tons of money, the guild intentionally put him at level 35 so that he can be used repeatedly without costing too much resources. And like all other denizens of Nazarick, Victim is extremely loyal towards the supreme leaders of Nazarick. 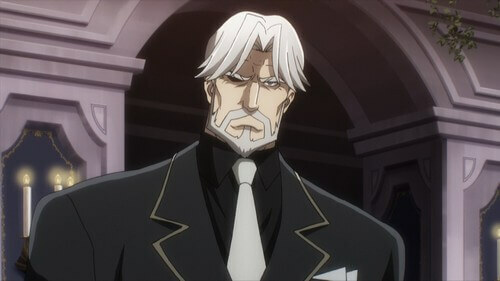 Unlike most Overlord characters we’ve discussed above, Sebas Tian is a butler, not a Floor Guardian. He normally takes the appearance of a charming old man with black suits like butler. He is the leader of the combat maids group called Pleiades Six Stars, which in charge of defending the 9th floor so that Momonga and his guild members can prepare for the last battle in Throne Room. Like his creator Touch Me, Sebas Tian has a strong sense of justice he does not despise any sort of races. He believes in human’s good nature and readies to help the weak. The only thing he despises is peoplewith wicked nature and he will ready to obliterate any sort of dangers poses to Nazarick. This also results in Sebas Tian’s conflict with Demiurge since they have totally opposite natures. Sebas Tian is a true monk who excels at unarmed combat. He is considered to be among the most powerful warriors in Nazarick. It is said that if he transformed into his true form, he can even surpass Albedo and Cocytus. Despite not learning any sort of magic, Sebas Tian is still capable of healing thanks to his Ki Master abilities. In the 9th spot we have the creation of Momonga himself – Pandora’s Actor. Pandora’s Actor is a doppelganger who takes charge of protecting Nazarick’s Treasury and financial management. He is also an interesting figure who dresses like a Nazi-soldier. In addition, he tends to have exaggerated gesture and body language since Momonga thought that it was cool when designing Pandora’s Actor. Since Pandora’s Actor reflects Momonga’s younger year of chunnibyou, when transferred to the New World, Momonga feels extremely embarrassed when witnessing his “childish past”. But putting that aside, Pandora’s Actor is an extremely intelligent NPC and he often asks questions even to his creator. That said, he is extremely loyal to the supreme leaders, especially Momonga and he always carry out orders precisely without any misunderstanding. He can also give out considerable suggestions depending on different situations. 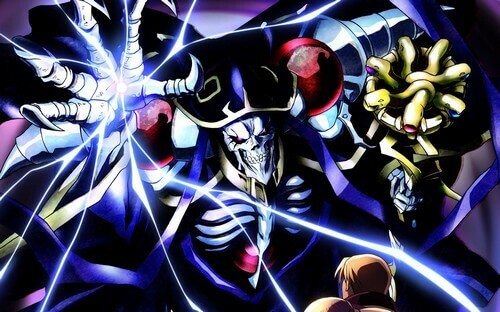 In terms of power, his main ability is shape-shifting which allows him to take form of every living being, including even 41 members of Ainz Ooal Gown guild. When taking form of a living being, he can uses all the copied being’s skills and abilities up to 80%. Therefore, Pandora’s Actor is considerably a very powerful character thanks to his versatility. In the New World, it seems all the Floor Guardians and the Pleiades haven’t met or known much about Pandora’s Actor. Therefore, there are quite a number of rumors about him, for example: Albedo claimed that his power even rivals herself and Demiurge mainly because of his intelligence. While Sebas Tian claims that his power is on the same level as all the Floor Guardians. As mentioned, Pleiades Six Stars is the combat maids group programmed to be the final bosses on the 9th floor of Nazarick along with Sebas Tian. 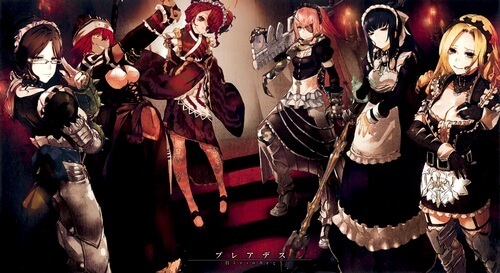 The group comprises of 6 maids, all are beautiful and appeal in their own ways, including: Narberal Gamma, Yuri Alpha, Lupusregina Beta, CZ2128 Delta, Solution Epsilon, and Entoma Vasilissa Zeta. Currently we haven’t known much about these battle maids except for Narberal Gamma and Solution Epsilon. Narberal Gamma is a doppelganger who follows Momonga as a member of adventurer team named Darkness. Although having beautiful human appearance, she despises weaklings especially humans. Thanks to Momonga’s teaching, she gradually learns about containing herself and stays careful towards everything even human. Narberal Gamma excels at magic casting; typically lightning spells which we have seen her performed back in season 1. The other battle maid who has fair share of appearance is Solution Epsilon who currently follows Sebas Tian on the outside world. Like other maids, she possesses beautiful and alluring appearance. Her beauty is said to rival the most beautiful woman of Re-Estize Kingdom – the Golden Princess. Although she may look like a human, she is actually a slime who likes to devour and toy with human. Her nature also allows her to take various forms and disguise her own personality. We have seen Solution’s deceiving skill back in season 1 and we have also seen her devouring a man with her body. Other members of the Pleiades have not shown their true power yet, but let’s hope that we will see more of them in the future. And that’s it folks! Those are the members of the Great Tomb of Nazarick we’ve seen so far. Of course, there are more members but let’s not spoil the fun. And for now, thank you and stay tune for more news in the future!